Gota’s MiG racket eclipsed by multi million dollar deal of Maharaja and son in law of president ! (Lanka-e-News - 26.Sep.2017, 10.40AM) May we recall Lanka e news reported in March this year about the unrelenting efforts of the owner of Capital Maharaja Co. aimed at becoming the new agent for importing of arms for the country , in order to sell a decrepit Russian warship to Sri Lanka after duping and deceiving president Maithripala Sirisena which could incur a loss of many millions of US dollars to the country. We also revealed that this corrupt deal even surpasses the MiG jet deal of ex defense secretary Gotabaya Rajapakse in magnitude. Now , unbelievably , the president as though he had fallen prey to this colossal corruption manipulation has tabled a cabinet paper as defense minister to push through this deal. According to the cabinet paper the amount involved in this deal is a whopping US dollars 158.5 million ! An attempt has also been made to justify this deal on the grounds :During the Rajapakse era a loan of US dollars 300 million was approved by Russia in February 2010, and because the balance on the loan was not used , that amount can be used for this deal , and that can be paid back as a loan. The Rajapakses utilized US dollars 165 million of this loan , and the balance of US dollars 135 million had to be utilized before 2015, but with the new government coming into power , that sum remained unutilized. Now, after paying an additional sum of US dollars 23.5 million this warship and equipment are to be purchased, and the loan must be paid back by SL with interest within ten years . The most perplexing part of this impending transaction is the proposal made in the cabinet paper to include this sum in the 2015 budget . It is only the economics wizards who prepared the cabinet paper of the president should teach us how this past transaction after two years have elapsed can be included in the budget of 2015 which is now history. This massive corrupt deal which eclipses even the MiG deal of Gotabaya Rajapakse another notorious culprit , merits a detailed exposure . It is most rudely shocking and startling why this deal is being pursued with such eagerness when there are much bigger issues of the masses that need urgent attention , and specially when the Navy Commander himself is opposed to the purchase of this decrepit Russian ship. This is a Gepard Frigate warship . This vessel has two helipads and two Antonov Cargo helicopters must also be purchased. Along with this vessel , six attacker supersonic SU 30 jets , and 33 war tanks are to be purchased. The present Navy commander totally opposed this purchase mainly because, what is currently needed for the country when there is no war are a number of very much cheaper sophisticated attacker crafts to provide security to the coastal belt. The corruption earnings area as gigantic as the ship ! This Russian warship for the purchase of which so much eagerness and enthusiasm is being evinced spending US dollars 135 million dollars , believe it or not is ten years old ! That is the stark truth. On the other hand the price of a similar brand new Indian warship with all these facilities is only US dollars 70 million ! By purchasing such a decrepit ship , the loss the country is going to incur is UD dollars 88 million ( SLRs. 1,34, 640 million !) . The colossal illicit commission in this deal is not second to that of the Norochcholai project . It is best if those who are engineering this deal realize at least at this belated stage these payments are being made not out of Chaturika’s earnings from the sale of her books entitled “President father’’, but out of the hard earned genuine public funds of the people. Whether the president will plead ignorance to this glaring truth is a different matter. The biggest commission share in this record breaking racket is linked with the supersonic jets to be purchased . These jets are 4 years old. The price of a brand new jet is US dollars 26 million whereas the price these great ‘patriots’ are going to pay for a four year old jet is US dollars 35 million. That is from each jet alone they are going to line the pockets with US dollars 9 million (Rs. 1380 million !). In other words , the total collection from the six jets they are going to purchase is US dollars 54 million ( over Rs. 8260 million !) . The next crooked collection is from the two Antonov helicopters to be purchased for US dollars 60 million , while the actual price is US dollars 39 million . Here, the succulent commission collection amounts to US dollars 21 million (Rs. 32130 million!). In addition , 33 war tanks are to be purchased ( we do not know who is the ‘Prince’ or ‘outlaw son in law’ who gave the instruction to purchase as many as 33 warships at once for a country that is not at war - how inappropriate and how wonderful !). Right now we do not have the prices of these warships . We shall reveal those details later. Based on reports these deals though ostensibly in Russia are to be concluded in Ukraine and Bello , Russia. The government of Bello , Russia is one that has broken world records in corruption and rackets. Those details shall be revealed later. We are unhesitatingly and without any doubt calling this deal as more squalid than Gota’s MiG deal based on the facts hereinbefore mentioned. Who is behind this corrupt deal which is as gigantic as the ship around which it revolves ? Lanka e news previously too posted a report on this sordid deal. Russia is a country from which SL has been purchasing weapons over a long period. The main Co. is Rosoboronexport , a semi government entity in Moscow. The local agent for that Co. was ‘Priyantha’ a relative of Rasaputra. We revealed after the demise of Priyantha that Shevan Daniel and Nimal Cook of Kili Maharaja are with the assistance of president Maithripala trying to secure that agency. Along with the president they even visited Russia on this account. After Lanka e news revealed all these details, some time later , kili Maharaja secured that agency. 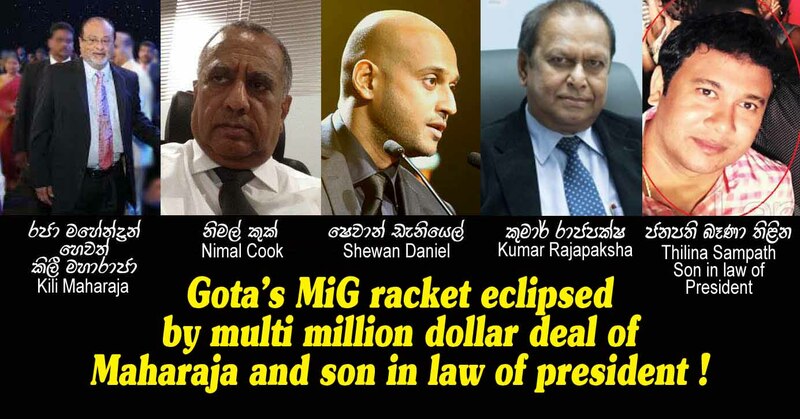 It is truly shocking , apart from the duo Shevan Daniel and Nimal Cook of Kili Maharaja , there are also Thilina Sampath the son in law of the president, Dr. Saman Weerasinghe , and another crooked wheeler dealer, presently ambassador of Russia, Kumar Rajapakse a weapons agent. The official term of Dr. Saman as ambassador of Russia was extended a further period of 3 months so that he will be there until this deal is concluded. The term of former Navy commander Ravindra Wijegunaratne too was extended so that the documents pertaining to the deal can be prepared . Might we recall , Lanka e news earlier on issued a dire warning elaborating on the dangers of allowing Kili Maharaja to import weapons viz a viz his traitorous antecedence. During the entire 30 year period of war , he was most noted for his underhand transactions with the LTTE terrorists who waged war against the legally elected government. It is noteworthy the three commanders of the forces are also not in favor of granting the agency to import arms to such a dangerous underhand dealer. ‘If any leader of a government is to grant the agency to a wheeler dealer to import arms who had underhand deals during the entire period of the war with the armed rebels fighting a cruel war against the government , either that leader must be insane or a traitor . If he is not either, he is unfit to be a State leader,’ we firmly warned previously. Sadly however , the president as defense minister ,under his signature has tabled the abominable anti national cabinet paper (aforementioned) exactly in the manner we foresaw and direly warned. May be the president is unaware of the infinite length , breadth and depth of this colossal corruption . Yet based on what have seeped through, Rs. 40,390 million of the public fund is directly being siphoned off into the pockets of the son in law of the president and the intermediaries . It is for the good governance president who has a great affinity for appointing ‘Commissions’ to show that same affinity for the masses too, and say something about this transaction which can cause a loss of Rs. 1,34,640 million ( Rs. 134.640 Billion ! ) to the motherland . What are the Red mask-eteer ‘patriots’ who appear on the maharaja television channels to blabber and bluff , while dancing like a puppet when Maharaja pulls the strings ,going to say about this ? What has the infamously famous anti corrupt organizations run by the advisors and secretaries of the president himself got to say in this regard? What are the so called loud mouthed blokes within the good governance government who claim and proclaim that they are against corruption, saying? What has the UNP’s Radical Tide which is against corruption got to say ? The whole country is obviously earnestly anticipating answers. * US dollars million Mega illicit deal not second to Gota’s MiG deal –Kili Maharaja moving heaven and earth to push through !! * Maharaja’s Rs. 300 million deal wheeler dealers in Maithripala’s Russian delegation but deal flops ! Dear LEN, ENOUGH IS ENOUGH! WE NEED TO FIND A CURE FOR THESE TWO TERMINAL CANCERS AT THE TOP BEFORE THE PATIENT IS DEAD OR ANOTHER CULPRIT TAKES OVER! THE WHOLE NATION IS IN A DANGER ZONE NOW!! We all agree that we may never find perfect people to fit into those shoes. However, late is better than never and there are more than enough leaders in the country, who has demonstrated that they can do a clean and a better job than those TWO MISFITS AT THE TOP. Therefore, it is high time to start backing an alternative President and an alternative Prime Minister for an alternative government in 2020, BEFORE IT IS TOO LATE!!! Agree with CITIZEN.. ENOUGH IS ENOUGH..Lets rid the country of DIRTY POLITICS! Mangala S for President.